How do we highlight our Thai heritage and use Singha Beer to connect the worlds of consumers and restaurant owners? If you want to promote the number one beer of Thailand, why not organize a nationwide search for the best Thai restaurant? In The Best Thai Award, we combine three of our favorite things: Thai food, drinks and healthy competition. In The Best Thai Awards, we use consumer’s tastebuds to decide who deserves a spot in the top Thai restaurant in the Netherlands and Belgium. Afterwards, the professional jury decides which restaurant gets the prestigious title. 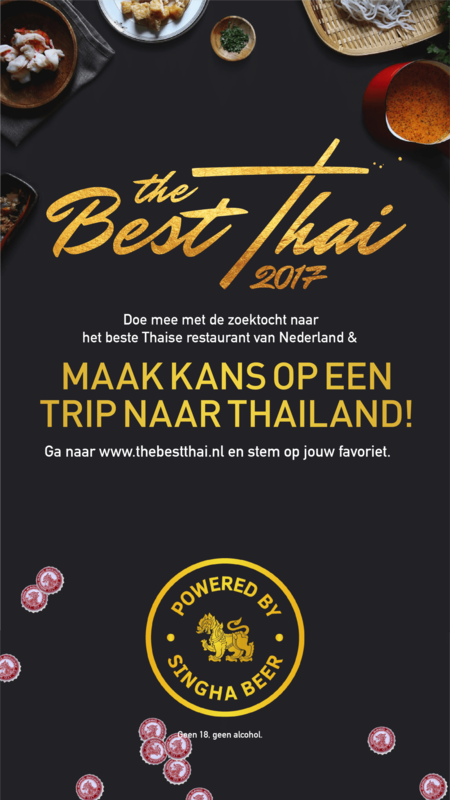 The Best Thai Award was successfully launched in 2016 in the Netherlands, and expanded to Belgium the next year. It’s activated via social media and native partners. The Best Thai 2019 is in the works, keep an eye out for updates on Facebook & Instagram. In addition to this yearly activation, we manage the Singha Beer Benelux social media accounts. Actively growing the community with mouthwatering social content since 2017. Social management, webcare, social advertising, online activation, offline activation. We have over 14.000 active fans, making Singha Benelux the second biggest Singha account worldwide.